Up until the NHL season officially starts, many will be participating in fantasy hockey drafts. With the injury ninja in full force last season there are no doubt more than a few questions to be raised about some of the players you might want to draft for the season. We'll profile some of the Question Marks leading up to the start of the NHL season to help you out. How will Jonas Hiller bounce back from his 2010-2011 vertigo-ridden season? Hiller was an All-Star last year and the numbers he was throwing up before he went all Lucille Two on us had people talking Vezina. Hiller has pronounced himself symptom-free, however doctors still haven't been able to determine the source of the injury, thus cannot guarantee he is permanently symptom-free. Hiller has been doing his regular workouts in his native-Switzerland and recently gave an interview to a Swiss TV Network with his gorgeous girlfriend (thanks to Puck Daddy for the link to the interview). After the two pucks he took to the head in the 2011 All-Star Game, what happens if he takes another one of the bucket? Does he go on the IR again for an unknown period of time? These injuries are the worst to deal with for fantasy owners as you just never know when they'll be back. IR and roster spaces may be scarce, but if Hiller can play to his All-Star level he is well worth the risk. If you can get Hiller as a 4th or 5th rounder consider it a steal, but it's your call to take a gamble on this type of injury to see if Hiller returns to a place called Vertigo. That picture tripped me right out. I would take a chance on Hiller. But like every draft it always depends on who is available and what pick you have. Sometimes top goalies are gone after the 4th round. As a film student, I love the Vertigo poster crop boys. I hope when Hiller returns he isn't as nervous as Jimmy Stewart. Score some goals for me at b-hock boys. Still can't believe he got hurt at an allstar game. Hiller should be ready to go. But I don't think he will put up his amazing numbers again from last year. Looking at the rankings in Yahoo. Hiller is ranked pretty high. When you can get Jimmy Howard 2 rounds later I think that is the safe bet. 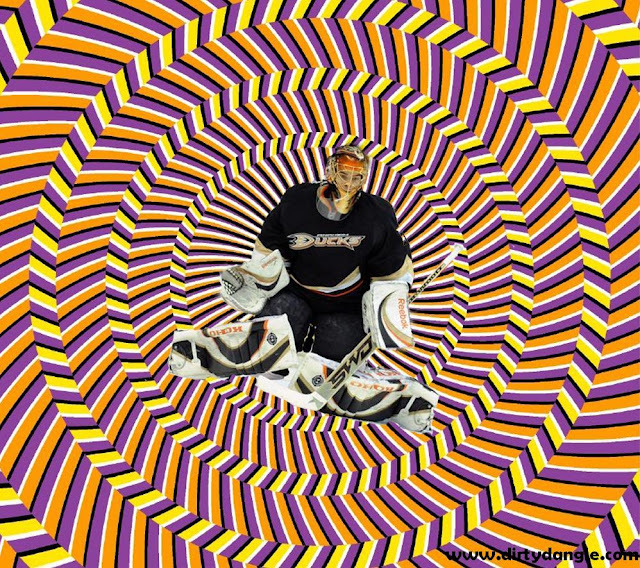 Trippy Hiller photo man. I just puked up my hash brownies looking at that.